After lunch at Tasty China, followed by a trip to IKEA, I felt the need for sweets on the way home. 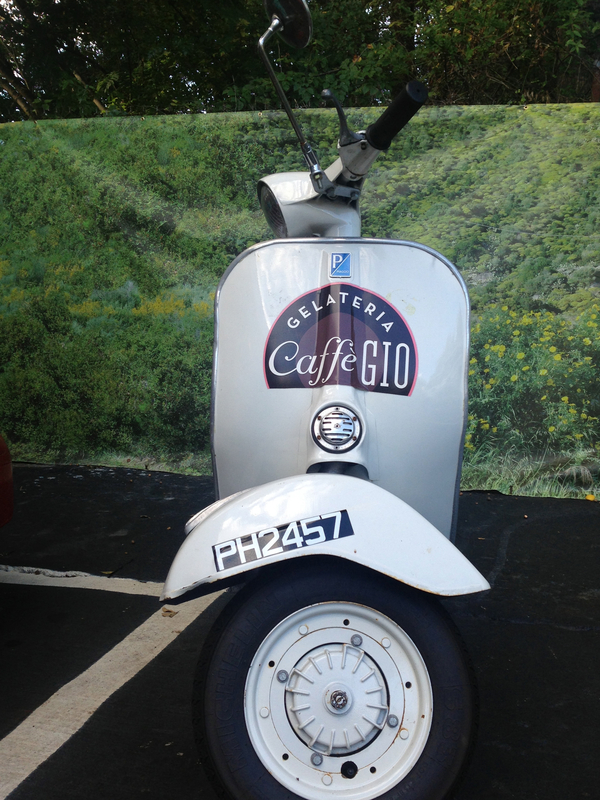 Driving through Home Park, stopping at Caffe Gio for gelato seemed like a great idea. Arriving close to 5:00, there was no one else there, although the tables on the patio showed signs of recent occupation. Gio’s is part of the Antico Pizza / Gio’s Chicken Amalfatino family and also serves lunch daily (although we were there past their lunch hours). 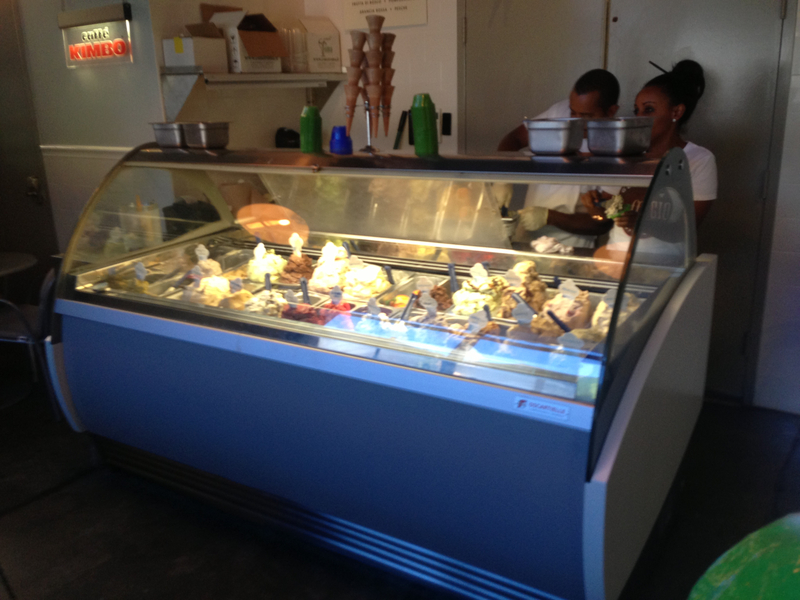 Walking in the door, the gelato was on a rainbow hued display. They had ten to twelve flavors, mostly chocolate or nut based, with a couple of fruits. Jo chose a split cup with pistachio (generally her favorite flavor) and salted caramel (apparently the “it” flavor of summer based on its prevalence around town in various incarnations) and I went with the orange sherbert. 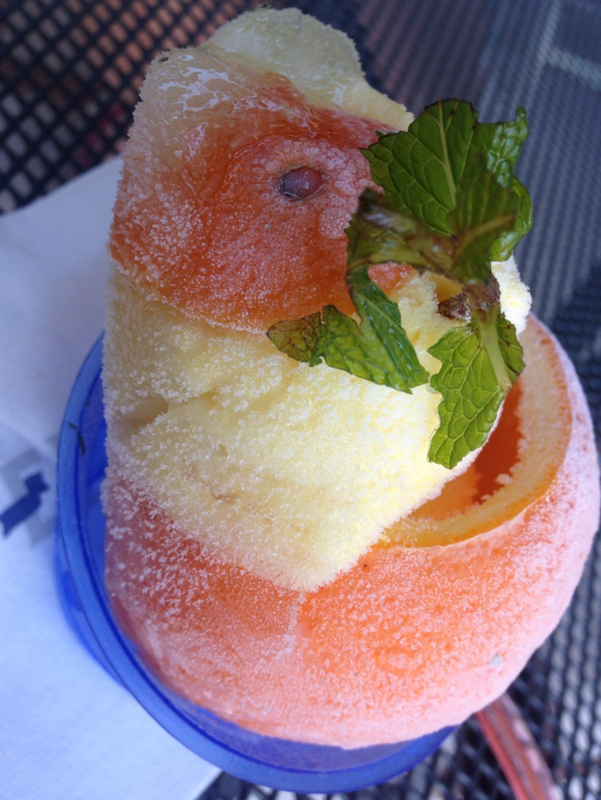 I’ll have to admit that I went with the orange sherbert solely because it was served in a hollowed-out orange. The sherbert was fairly tasteless (possibly a victim of having been in the case too long), but the salted caramel gelato was (supposedly) phenomenal. The consensus between us on the gelato was that it was much heavier and ice-creamier than at Paolo’s, our favorite gelateria. In doing some research on-line, it appears that it may be because the gelato at Gio’s is actually imported from Italy, as opposed to being made on site. Note: I did have a bit of a challenge deciding between the use of the word “gelato” as a plural or “gelati”. 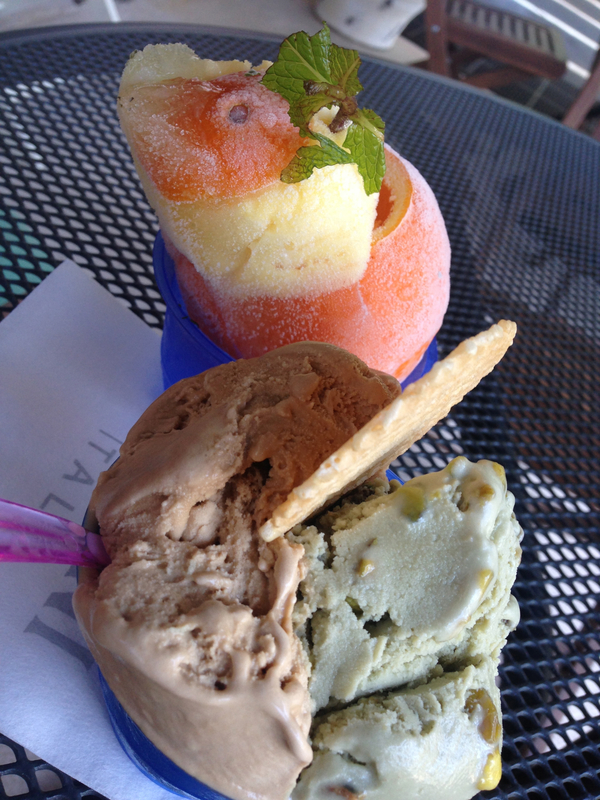 I tried using “gelati”, which I believe to be correct, but it just looks wrong. If anyone wants to weigh in an opinion, I’m open to thoughts on that.